The bars show the number of incidents - CHAOS aggregates them all, and then you have the components -- demonstrations, riots, assassinations, and general strikes. As the bars get darker, cuts get deeper. 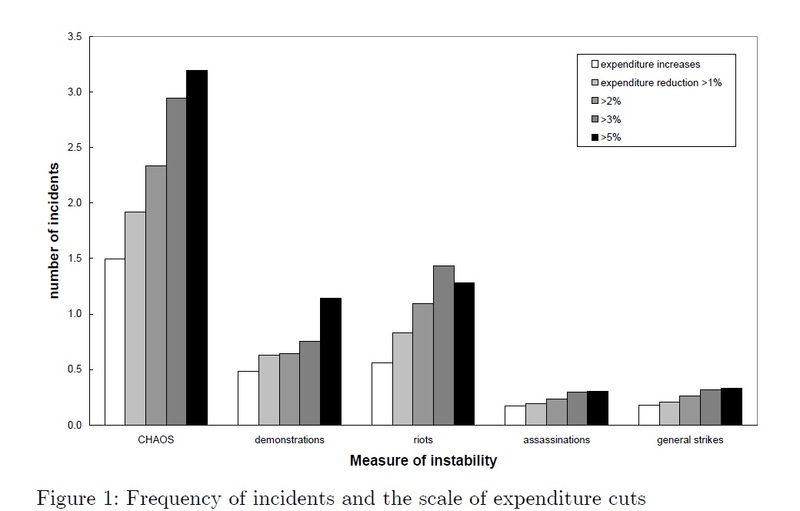 Once you cut expenditure by more than 2% of GDP, instability increases rapidly in all dimensions, and especially in terms of riots and demonstrations. Sure, there are many incidents that can lead to an eruption of violence– from the killing of Mark Duggan in London last Saturday to a high-speed pursuit gone wrong (in the case of the Rodney King riots in LA in 1992). The more interesting question is -- why are cities at some points in time more akin to a tinderbox? Why does it only take one incident for massive violence, riots, or anti-government demonstrations to erupt? Even if there is something else that provides the spark, you want to know why there is so much dry wood around that you get a conflagration. Here, our results suggest that the role of budget measures is important. We also use some additional, more detailed data on the causes of each demonstration to confirm our hypothesis that the link is causal. Incidentally, the same pattern is apparent in Latin America since 1937. So, if you ever found yourself reading papers by Alesina and co-authors arguing that i. budget cuts can be good for growth ii. there is no punishment at the polls for governments cutting expenditure, and wondering why governments don't engage in more austerity - maybe here is your answer. Even if (and it's a big if, given the IMF's latest research) Alesina et al. are right, and growth can follow cuts, the pain may be concentrated amongst some groups. If these become massively unhappy... it can start to look pretty ugly out there in the streets, and I doubt that that'll be good for growth. 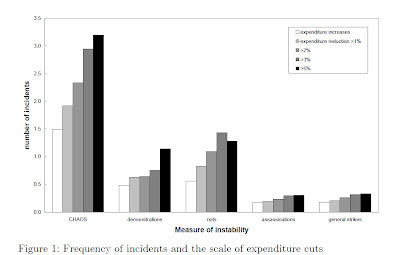 As a matter of fact, Nick Bloom of Stanford has a bunch of fantastic papers showing just how painful uncertainty shocks are in terms of subsequent economic performance.